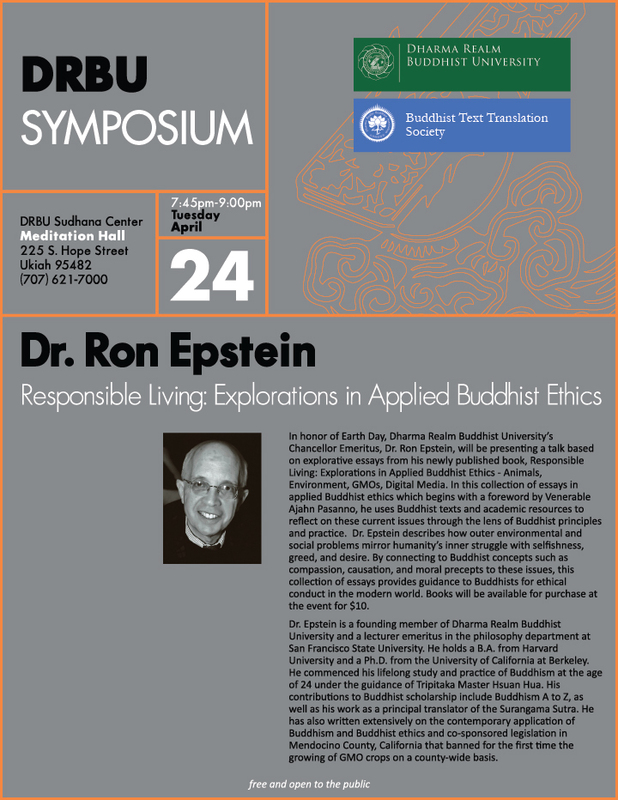 As Earth Day approaches, Dharma Realm Buddhist University and the Buddhist Text Translation Society are delighted to announce a new publication by Dharma Realm Buddhist University’s Chancellor Emeritus, Dr. Ron Epstein, Ph.D. Responsible Living: Explorations in Applied Buddhist Ethics - Animals, Environment, GMOs, Digital Media is a collection of exploratory essays which uses applied Buddhist ethics, with support from passages in classic Buddhist texts, to address a host of modern day issues related to the environment, animal rights, and digital media. To commemorate Dr. Epstein’s new book, there will be a talk and book signing at DRBU’s Sudhana Center, at 225 S Hope Street in downtown Ukiah, on Tuesday, April 24th at 7:45pm. This event is free and open to the community. Dr. Epstein began his study and practice of Buddhism at the age of 24 under the direction of the Venerable Master in the 1960s shortly after the Master arrived in San Francisco. Prior to this collection of essays, Dr. Epstein worked as one of the principal translators of the newly translated Shurangama Sutra in English. He has written extensively on the contemporary application of Buddhism and Buddhist ethics, and also co-sponsored legislation in northern California which banned for the first time the growing of GMO crops on a county-wide basis. Responsible Living is available in paperback at the CTTB bookstore, and online at www.bttsonline.org, Amazon (https://www.amazon.com/gp/offer-listing/1601030991/ref=tmm_other_meta_binding_new_olp_sr?ie=UTF8&condition=new&qid=&sr=), Amazon UK, Amazon AU, Amazon BR, Amazon JP, and Amazon MX. Ebook versions are scheduled to be released in July. We look forward to sharing more with you about this release!